Since health care is such a big topic in the US right now, we thought you might like to know that the healthcare in Mexico is FANTASTIC, state of the art, and at a fraction of the cost. Just before Christmas Kirk was shocked to find out he had a small hernia?!? He had had a swollen leg that wasn't getting better so he went to the doctor in Puerto Vallarta to get that checked out. Turns out it was an infection, likely picked up from swimming in the Sea of Cortez with a small scratch or cut, and antibiotics quickly took care of the infection and swollen leg. But during the ultrasound of his leg, they noticed he had a small hernia. Who knew? He certainly didn't feel anything or have any symptoms of one. But wanted to get it taken care of right away in PV. Puerto Vallarta is known for their Medical-Tourism, and we know many people who've had major surgeries here. Many of the doctors and at least one of the hospitals (San Javier) are also bi-lingual. 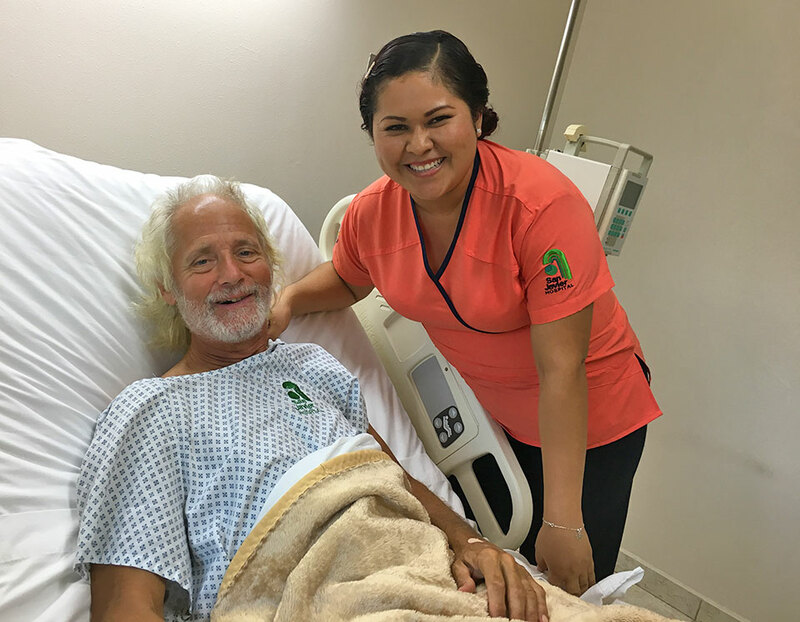 So we asked around on the cruisers VHF radio Net for a recommended doctor to repair Kirk's hernia and were referred to Pam Thompson at Puerto Vallarta Health Care Resources (an expat health care advocate.) She made an appointment for the next day for a consult with the surgeon, where we scheduled the outpatient hernia surgery for the first week in January. As has been the case everywhere we've had medical appointments from Ensenada and La Paz to Loreto and Puerto Vallarta, if you call a doctor or dentist for an appointment, they usually get you in that day, sometimes within hours, or at the very least the next day. 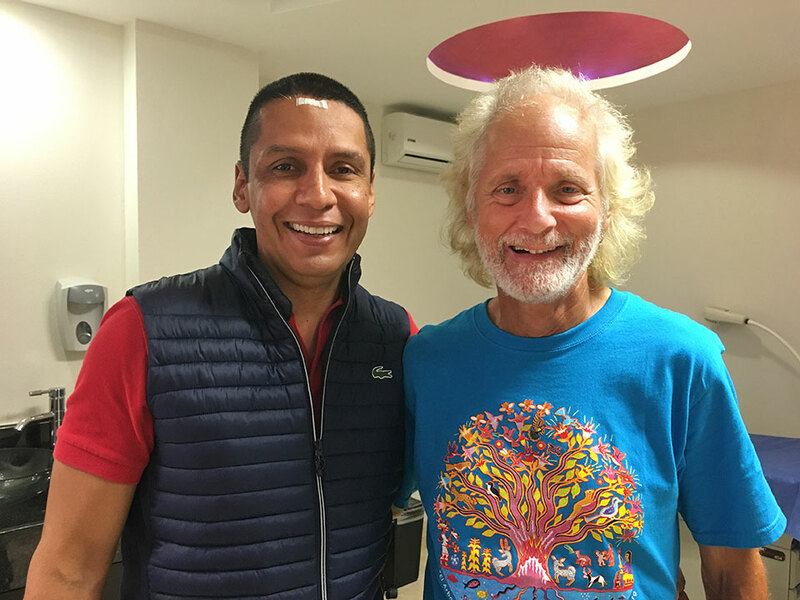 We had a great teeth cleaning experience in La Paz, and when we called to schedule our appointments for the following week, they told us to call back next week--they don't schedule ahead. Amazing concept, but it seems to really work well here. Knowing that we'd have to stick around Puerto Vallarta for a least a month for Kirk's recovery we moved Due West back to Marina Vallarta which was just across the street from the doctors and hospital so everything was within walking distance. We hoped to head back to Marina La Cruz for his full recovery after the surgery. We arrived at the hospital at 0715 and after a quick intake we were taken to Kirk's private recovery room. It was like a hotel room with large picture window looking over the bay, large couch, big-screen TV, large private bathroom/shower with little wrapped soaps and shampoos. NOT like any hospital room we've ever seen before. (But then we haven't been in all that many, maybe they are all like that these days?!) The staff told Heidi she could hang out there all day if she wanted to. Kirk was immediately surrounded by several guapa Mexican nurses, poking him with needles and decorating his wrist like a christmas tree with ID tags. Then he was whisked away and doesn't remember much after that, except that the room was cold. 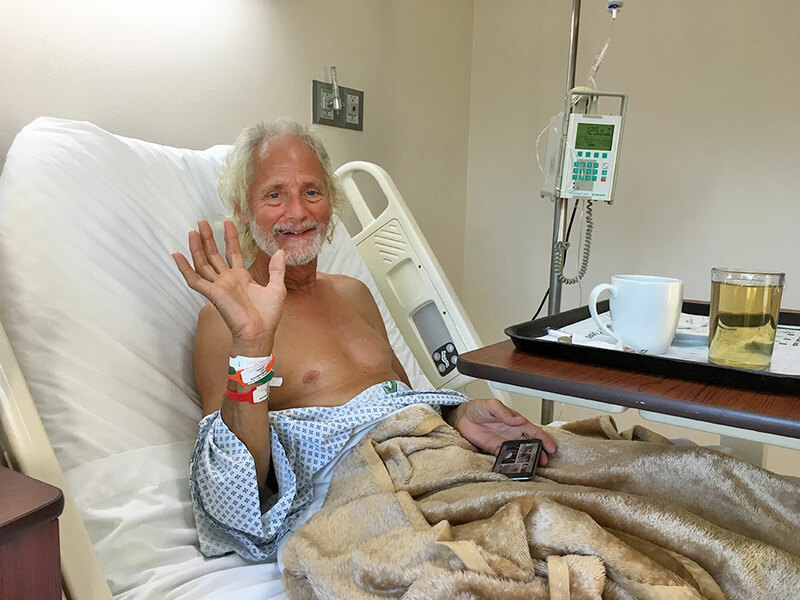 Meanwhile, although the recovery room was nice, Heidi headed back to the boat to hang out with the gatos del mar and get some work done until she got the word to return, and break Kirk out of there late afternoon. BIG THANKS to our friends Judy & Paul who picked us up and drove us the short distance to the boat so Kirk wouldn't have to walk. We were totally impressed with the whole doctor-labs-surgeon-anesthesiologist-hospital experience. And all for around $2,000 US. Total, for everything... including labs, x-rays, EKG, pre-surgery appointments, surgery, 12-hr. hospital stay, and post-surgery follow up appointments. That's less than our deductible in the US. Did we mention the care was fantastic!?! REALLY IMPRESSED!! The doctors here also are not married to Big Pharma, and more often than not we've been prescribed vitamins and herbs by doctors, rather than synthetic pharmaceuticals that will do the same thing. This is not to say that pharmaceuticals don't have their place, Kirk's leg infection responded very well to antibiotics. It's just that the doctors here don't tend to prescribe meds as the first solution. Case in point, Heidi was having some joint pain and the doctor prescribed swimming in the salt-water every day. It totally worked! Something about sodium/potassium imbalance and osmosis of swimming in salt water. In the US she would have likely been prescribed pain killers. To recap our Mexican Health Care Experience... Just DO IT! You'll be glad you did. 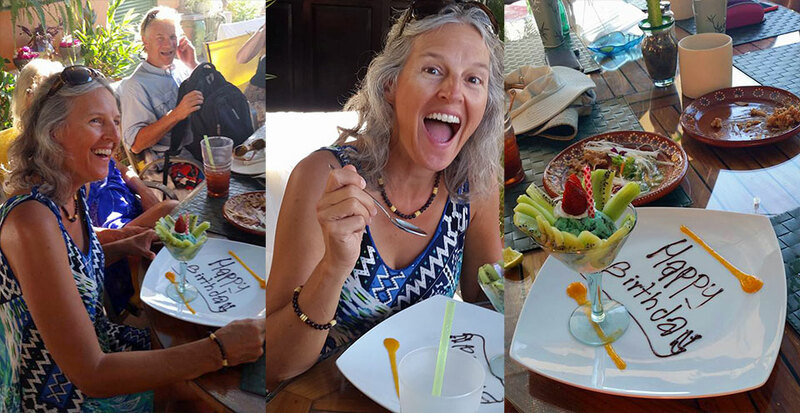 The next week was Heidi's birthday, so we grabbed a bunch of said friends, and headed to Los Arroyos Verdes for Heidi's pool-side birthday party. What a FUN, SUNNY, warm day at this eco-friendly resort complete with lovely swimming pool and gardens, delicious organic buffet, and live band. THANKS to all of you who made Heidi's birthday FANTABULOUS! If you're ever in the Bucarias area, you must get a day-pass at Los Arroyos Verdes! $300 Pesos ($15 US) gets you an all-you-can-eat delicious buffet, one drink, and use of the pool, gardens, hammocks, etc. Great value! THANKS to all of our cruising friends for helping to make Heidi's birthday great fun!! Clockwise from bottom left: Scott & Viviane (s/v Juniper), Heidi, Boni & John (s/v Ingenium), and Karen (s/v Meridien.) Missing from photo but not from the FUN: Seattle sailing friends Judy & Fred (s/v Wings), Judy & Paul (s/v Grace), Randi & Jerry, Roger (s/v Meridien), and photographer Kirk! More happiness at Marina La Cruz when we finally met Canadian cruising family Diane, Maia, and Evan on s/v Ceilydh (pronounced Kay-lee) who had just finished their circumnavigation. Diane Selkirk is an award-winning freelance writer and photographer who'd first Skyped with us from Australia 3 years ago when she wrote an article about our boat fire. 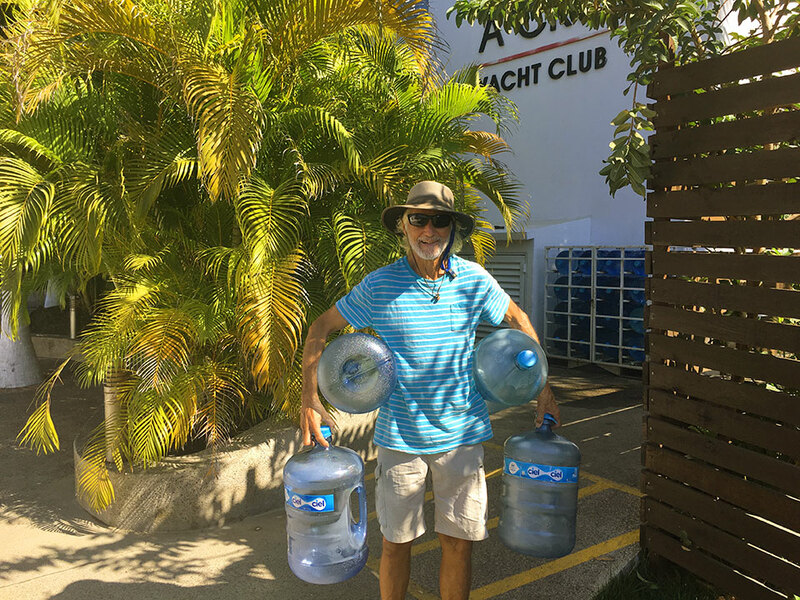 We followed their blog and sailing adventures for the next three-years as they completed their circumnavigation across the Indian Ocean, around the tip of Africa and through the Panama Canal, so it was great fun finally to met them in person here in La Cruz! 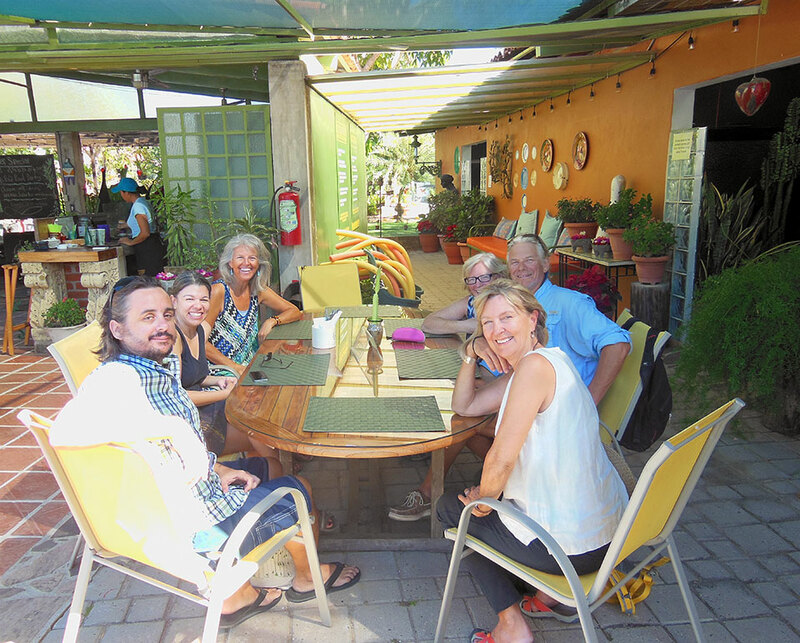 Our long-time Seattle friends Roger & Karen on s/v Meridien showed up in La Cruz, and it was fantastic to spend some time with them again too, though we were often buried in our HAM studies (see Part 3 below). 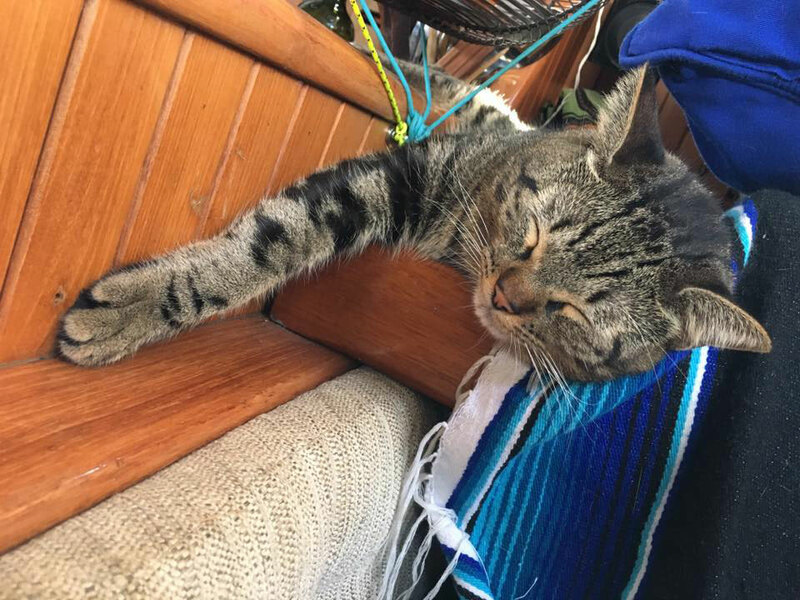 And our San Francisco Fleet Week Air Show Buddies [See San Francisco Days post] Ginny & Stephen on s/v Jabaroo II have just arrived in La Cruz. We look forward to fun-times with them as we show them around this great town. Happiness is Two Kitties who give unconditional love, keep us entertained, and remind us to PLAY daily! Heidi had another personal reason to get her HAM license as well. Her grandmother Wini had been studying to take the HAM Exam (including full Morse Code, which is no longer required) just before WWII broke out. Sadly for Wini they stopped all HAM Exams and amateur radio use because of the War Powers Act. (It's still a law today and that was actually one of our test questions!) Wini never did get her HAM license. Heidi's great-uncle Vin was also affected by the War Powers Act, building his HAM Shack prior to WWI breaking out, when the first car young-Wini had ever seen drove up to the house and the FBI told her brother Vin to cease and diciest building his radio shack. So Heidi was determined to pass the Technician and General Exams in honor of her Grandma Wini. 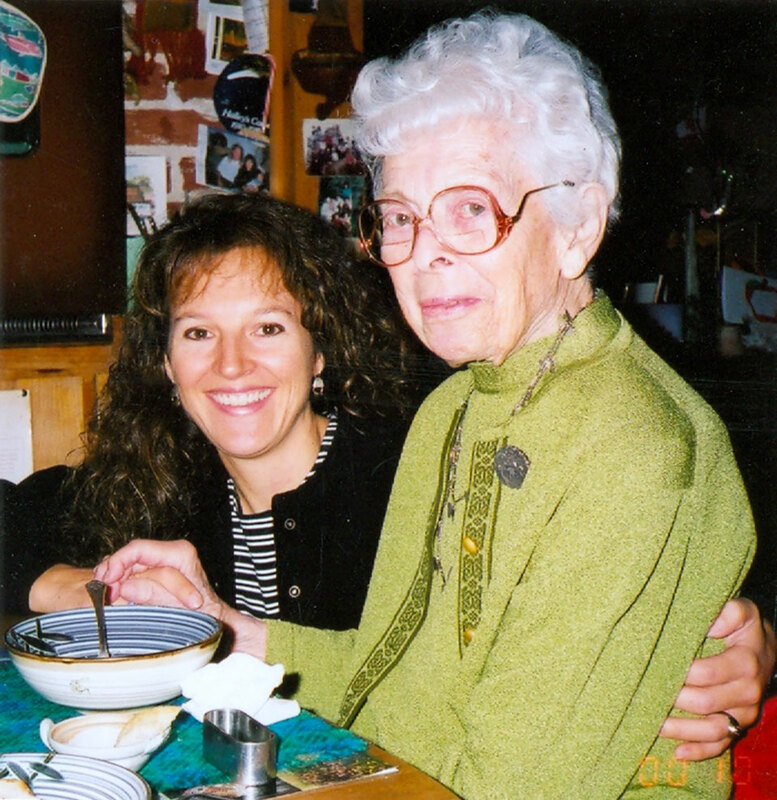 Heidi and Grandma Wini (circa 2000), the driving force behind Heidi's HAM license. Heidi used to listen to stations around the world on the short-wave radio in this kitchen as a kid. Wini would have been 110 this month! We started studying to take the HAM Exams back in Seattle, and had been chasing exam dates and locations down the coast since we left 18-months ago. We were always too late (exam just took place) or too early (exam wasn't for another month or two) everywhere we stopped. 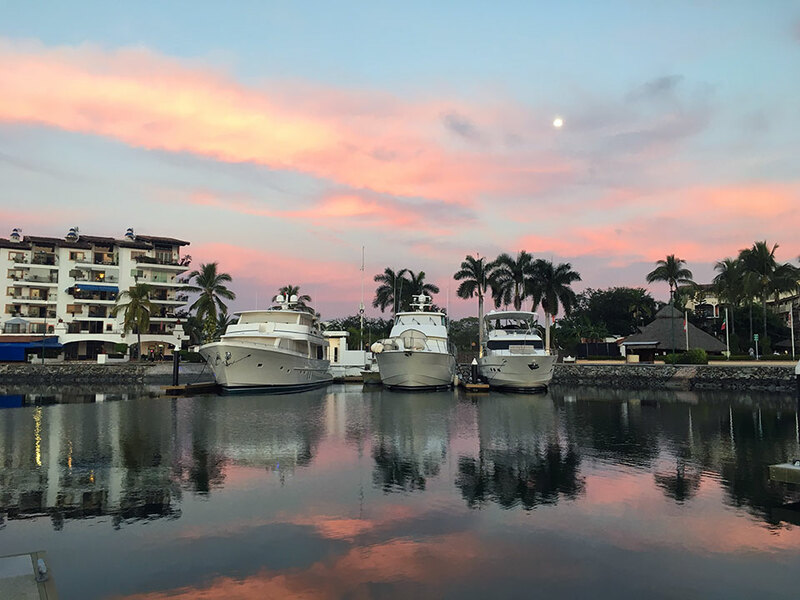 Finally a HAM Exam was being held at Vallarta Yacht Club in Puerto Vallarta and we were HERE! We had heard great things about HamTestOnline, so we signed up for their money-back-guarantee study program, and HIGHLY recommend it!! We preferred the online study guide rather than a book. They recommend studying for a short/intense duration before the exam, as a lot of the questions are rote memorization. We started studying full-time about 2-weeks before the exam, spending 5-8 hours a day the first week studying for the Technician Exam, and 8-12 hours a day during the second week for the General Exam. 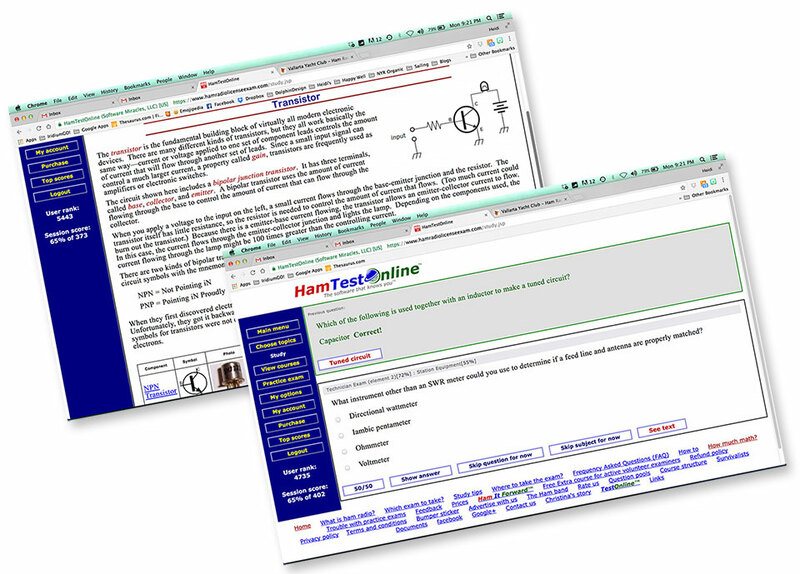 The online study program runs you through all of the 500 questions in the test-pool (of which 35 were drawn for each exam, some VERY technical.) The program tracks your progress and feeds you the questions you get wrong more often, until you learn them. So you cover WAY more material than you are actually tested on, but you have no idea which questions may be on your exam, so you need to learn all of them. Learning all of the frequencies were really tough! The Gatos del Mar loved having us home 24-7, even if we didn't take much time to play with them wile we were nose-in-the-computer studying. 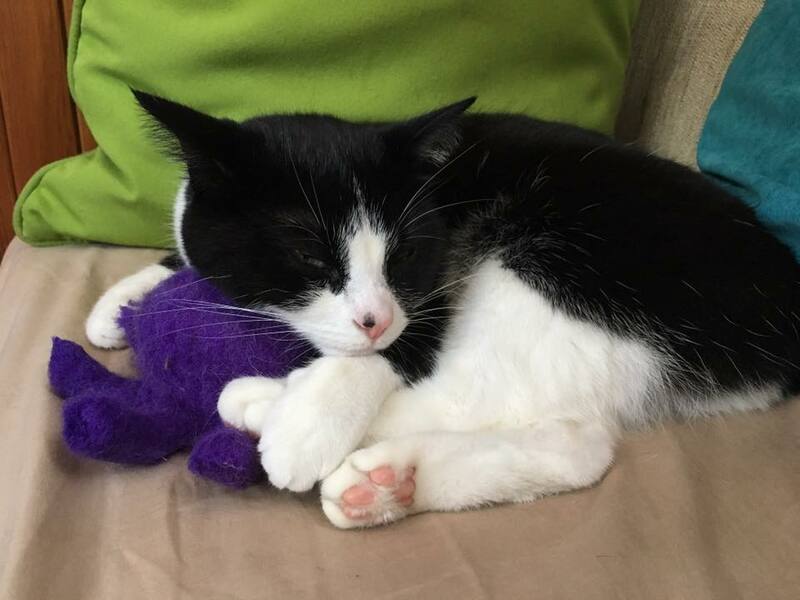 They made great, cozy study-buddies! As you can imagine it was an intense two weeks of exercising our brains. Heidi hadn't studied that hard since college, and Kirk since he took his Landscape Architecture Licensing Exam! At times we felt like we were banging our head into a brick wall, and had to take a break and go for a walk in the fresh air... but we toughed it out and it paid off. We all have different styles of learning, and Heidi made up all kinds of mnemes (stories) to help her memorize everything! While Kirk, having re-wired our whole house and boat, already knew a lot of the electrical components. Captain Kirk getting ready to take the HAM Exam along with 15 others. Everyone must sit at separate tables, and there were multiple different exams to ensure no cheating. 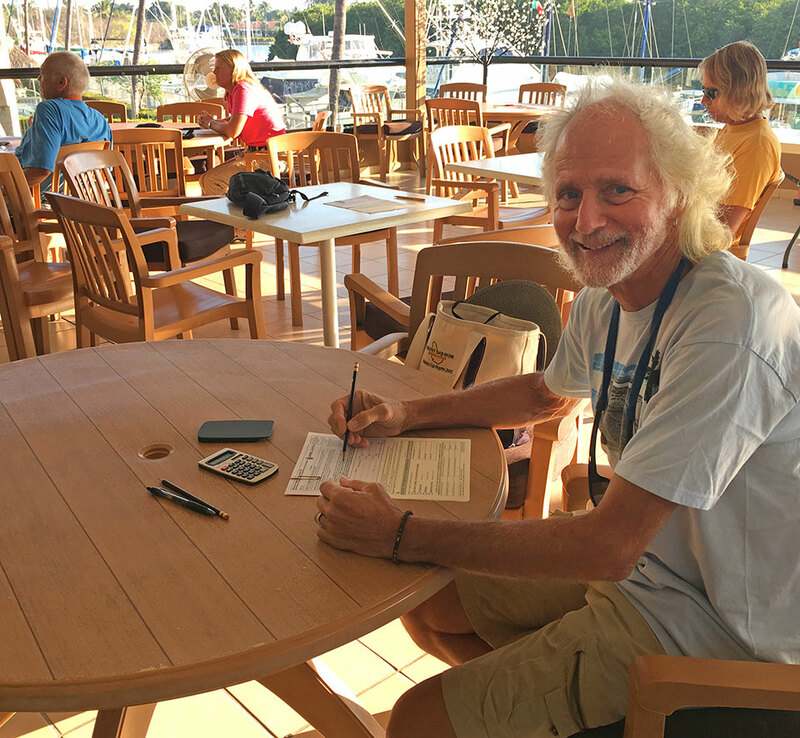 It was the largest HAM Exam group they'd ever had at Vallarta Yacht Club! You have to pass the Technician exam (the easier of the two) before you can take the General exam. The General exam was a nail-biter, but in the end we both passed both exams with flying colors. You're allowed to miss 9 questions per exam, and it is NOT intuitive unless you are a total gear-head-geek... which we are not. Kirk only missed 2 on the Technician and 5 on the General! Heidi missed a couple more on each but with plenty of room to spare. Each exam only took about 30-minutes to take, far less time than the hours we put into cramming for the exams. And we were thrilled that we both passed both exams as quite a few didn't!! A BIG HUGE THANKS to our "Elmer" John Carscadden for all his help and encouragement too!! So now we are officially HAMsters! We are still awaiting our call signs, and as soon as we get those we plan to check in with the Sonrisa Sailing Net, and chat w/ a few of our HAMster friends at home too. 73 and 88 to all of you HAMsters! So we have our health and happiness, and we pursued our HAM license and WON! We hope to soon be moving south to Tenicatita/Bara de Navidad and then on to Manzanillo area for the next couple of months before heading north and back to the Sea of Cortez for the summer months. By this time next year we should be on our way to Panama, so come and visit us this year in Mexico if you can!! Hang tough in the USA and please keep up the good fight for our Constitutional Rights, Bill of Rights, DEMOCRACY, and FREEDOM for ALL...The World depends on it!! Remember to view more photos in our Photo Gallery.